(Bloomberg) -- For stocks worldwide, it may be time to worry about the upcoming earnings season. But there’s one place where profit estimates are surging: India. 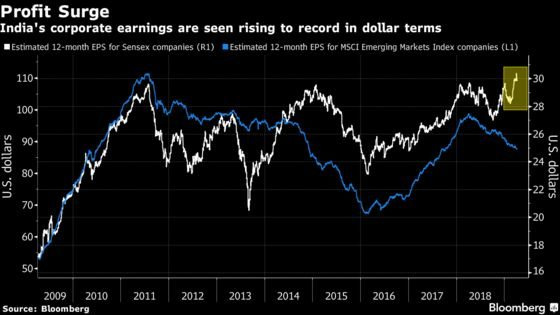 The fundamentals of corporate India are improving, and the average analyst projection for next year’s earnings at S&P BSE Sensex Index companies has jumped to a record high -- not just in rupee terms, but also in U.S. dollars. That’s a stark contrast with members of the MSCI All-Country World Index and MSCI Emerging Markets Index, which have seen steady declines in estimates. “We expect the earnings recovery momentum to continue this quarter as well with aggregate earnings growth expected in mid-double digits,” said Jyoti Vaswani, the Mumbai-based chief investment officer at Future Generali India Life Insurance Co. overseeing 40 billion rupees ($570 million) in assets. She expects corporate banks to report a significant recovery in earnings, while retail banks are expected to continue with their steady performance. The beginning of the earnings recovery may be apparent in results for the final quarter of the last financial year, ended March 31, particularly when it comes to banks. With financials accounting for more than a third of the Sensex, good results for the sector could help boost the nation’s stock market. A pickup in credit demand and a recovery in loans is helping the firms now, after a mountain of bad debt -- especially at state-run banks -- dented profitability last year and took the market down 14 percent from a peak. For the three months ended March 31, profit at NSE Nifty 50 Index members increased 15 percent, almost double the 8 percent pace a year earlier, Motilal Oswal Securities Ltd. estimates. JM Financial Ltd. sees earnings-per-share up 17 percent, buoyed by financials and health-care companies, even as telecoms and autos remained a drag. FUTURE GENERALI INDIA LIFE INSURANCE CO.
Fast moving consumer goods makers to deliver slower pace of growth as rural demand has tapered off, while lower sales realization and rupee appreciation kept the performance of metals producers subdued.